Codeine, circa 1990 (from left): Engle, Brokaw, and Immerwahr. Things seem to be always getting faster. The jump cuts introduced on early MTV seem about as rapid-fire as a bingo game these days, while the flood of new bands that jammed everyone’s dinky radars back in the early ’90s would probably be a drop in the bucket compared with today’s ever-expanding musical bandwidth. Codeine, a band that fermented in the Boston and New York scenes in the early ’90s, has never seemed fast no matter what the perspective. Fans who were there from the start and fans that picked up on the trio years after their short career (1989 to 1994) was over were faced with the same fact: Codeine played its music very slow. Even the album covers made apparent that the concept scaled to all degrees, from the celestial “Frigid Stars” to the architecture-gawking “Barely Real,” and the stark tree trunk of “The White Birch.” Everything loomed large and methodical through Codeine’s lens. 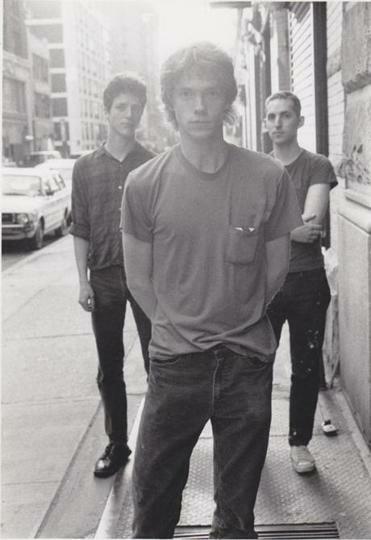 Reunited for their current tour, Codeine’s trio (from left) of drummer Chris Brokaw, bassist-singer Stephen Immerwahr, and guitarist John Engle. The archival label Numero Group has just released a deluxe set (“When I See the Sun”) reissuing the band’s two albums and one EP along with a hefty supply of B-sides, outtakes, and demos over six LPs (or three CDs). And Codeine has reunited to celebrate, already pulling off a string of European performances and gearing up for a US run, including Boston Saturday night at the Brighton Music Hall. Brokaw says onlookers would often ask if they played slowly because that’s all they could do. “It was as if they thought we rolled out of bed playing really slowly, which I suppose is possible, but it’s not what happened,” he says. Brokaw himself has given ample evidence to the contrary with his subsequent career as a guitarist in the abrasive Boston-based rock band Come (for which he eventually left Codeine), and as a drummer in The New Year and even with the notoriously rowdy G.G. Allin. Engle says the approach was always a means to an end. “The whole style really conveyed what it was that Steve wanted to get across, which was kind of a feeling of immobility and distance,” he says. Instead, that end left a tidy body of work for fans to live with ever since. There were no hits, exactly, so high spots come from audience’s experiences: great moments that evolve over time and whispered lyrics that seem to have been suspended in silence for years. It’s taken what the band might have worried about being a hollow production and turned it on its head. It’s almost the perfect tag to the band’s output — a harmonic resolution that took decades to come around. The city moves closer and closer to losing beloved alt-radio beacon WFNX, with the latest step toward the precipice being Saturday night’s “We Want the Airwaves: A WFNX Tribute” blowout at the Paradise. The night includes performances by O Positive, Orbit, Garvy J, and Parlour Bells, plus sets from past and present FNX DJs Paul Driscoll, Adam 12, Bruce McDonald, Duane Bruce, and Mike Gioscia, who will spin sets throughout the night. Organizers also promise a clip from the upcoming documentary “We Want the Airwaves,” produced by former FNX stafefrs. Proceeds go to the Progeria Research Foundation. . . . Current king of the freaks Walter Sickert leads his Army of Broken Toys to Somerville club Radio on Sunday to host a “Monster Masquerade” show (costumes are thoroughly encouraged). The creaky circus of junked punk alt-everything brings along local theater-friendly groups Jaggery and Bent Knee. . . . Finally, Hogwarts faves Harry and the Potters, the bespectacled wizard tribute band, look to celebrate their 10th anniversary on Friday night at the secluded Eliot Tower at the top of Great Blue Hill in the Blue Hills Reservation (that’s in Milton). Fans will meet at the trail head at 5:30 p.m. for a quick hike up to the top, then take in a mighty view and magical singalong with the band.